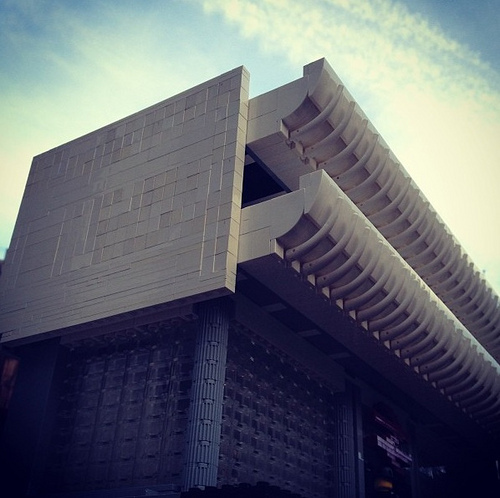 I don’t think I’d ever call Brutalist buildings beautiful, but they’re certainly interesting. Fairly unpopular and often built from materials like concrete that don’t always stand the test of time, many Brutalist structures are at risk. Rob H. (rh1985moc) built a LEGO version of Preston bus station in England to highlight the latest plan to demolish it. Rob even highlights the stark lines and curves of his LEGO model using photo processing reminiscent of snapshots from the 60’s or 70’s. Head on over to Flickr for interior shots. This really is a stunning photo. It could easily be mistaken for a picture of the real building at first glance.